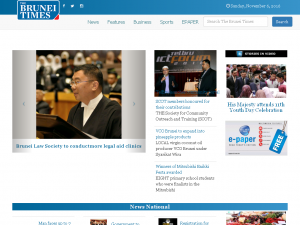 One year and two months ago, in November 2016, the newspaper The Brunei Times (BT), closed and took down its online news website along with its exit. This website was chock-full of BT news articles dating back to 2007. It didn’t have the slickest of website designs, but it was functional, had a good search facility, and was mostly reliable. It was also well-indexed and likely to come up at the top of online search results, making it easy to find information; whether you were a student or researcher, running a business or getting work done, or just looking for information. Newspaper resources are available at libraries for reference, but for many of us, BT’s online archives are sorely missed. We used to be only a Google search box away from finding the article we wanted. It is not always easy to find current, authoritative information about Brunei online. So for anyone still struggling with the loss of BT’s website, this is a brief guide that will help you search for copies of BT’s online articles. (Spoiler: There is a flowchart! And a little bit of work ahead.) Good luck! You will primarily learn to use the Wayback Machine (web.archive.org) and be aware of other sources to look into. These sources help you to search for the article, but does not guarantee you will find it. It’s possible that the article you are looking for has not been archived online. If the article seems incomplete, it’s because I had wanted to write a detailed guide, but changed my mind. There were even cute icons! In the end, I found it more valuable for my time (and sanity) to just post what I have completed so far. If you are interested in possibly adapting, extending or otherwise re-appropriating the guide in other forms, I would be open, and even happy, to see that! I can envision this guide as, say, a web app, or a video or some form of interactive visual guide, or even a comic. *hint hint* Please see the Creative Commons license at the end of this article if you are interested! Disclaimer: Most of my thoughts here are speculative and in no way constitute definitive statements on the state of Bruneian literature in English. For more rigorous analyses, I can point you towards some of my academic work on Bruneian literature in particular: I have an article in the Journal of Commonwealth Literature, a book chapter in The Use and Status of English in Brunei Darussalam: A Kingdom of Unexpected Linguistic Diversity, a forthcoming chapter in a volume called Women in Postcolonial Southeast Asian Literature and another forthcoming article in a special issue of the journal World Englishes. I discuss various aspects of Bruneian literature and narrative-making in English and Malay in these publications, including representations of women, horror story tropes, and the imaginative horizons of Bruneian fiction. I have followed with interest the development of local writing movements, including original theatrical productions such as Jongsarat by non-profit organization Seeds, and the writing jams and Spoken Word events organized by indie publishers Heartwrite. When talking to people interested in these events, it seems to me that there is a general desire for literary and artistic community, but that there is also uncertainty about positioning oneself within a genealogy of Bruneian narrative-making. Faiq Airudin puts it excellently in his post about Bruneian Creative Industries and the tendency to “firstisms”; I hope this article will be of interest to Bruneian writers and readers interested in Bruneian literary history in English. I leave it to someone much more informed than me to write something on Bruneian theatre and local productions (which I will obviously read with great interest). First, a look at the numbers. I’ve compiled what I think is a fairly comprehensive list of Bruneian literature in English (a version of this list first appeared earlier this year in the Springer chapter referenced above), although I strongly suspect that there are other works that I’m not aware of. One of my motivations for writing this article for Open Brunei is to crowdsource information on Anglophone Bruneian literature – defined in this article as literature written primarily in English, and is about Brunei or by a Bruneian. I’m hoping that if any readers know of a text that fits the criteria, you’ll let me know so that we can build a comprehensive corpus of information. An estimated 13-min read. I’ve split this into two parts because, as usual, it got unwieldy and I was never going to see a finished version otherwise. Thank you for reading. On Open Brunei, and as individuals, we’ve been dealing with data, collecting it, and making sense of it. The facts project Bruakal involves looking for statistics, sometimes even calculating them ourselves using the figures we find. 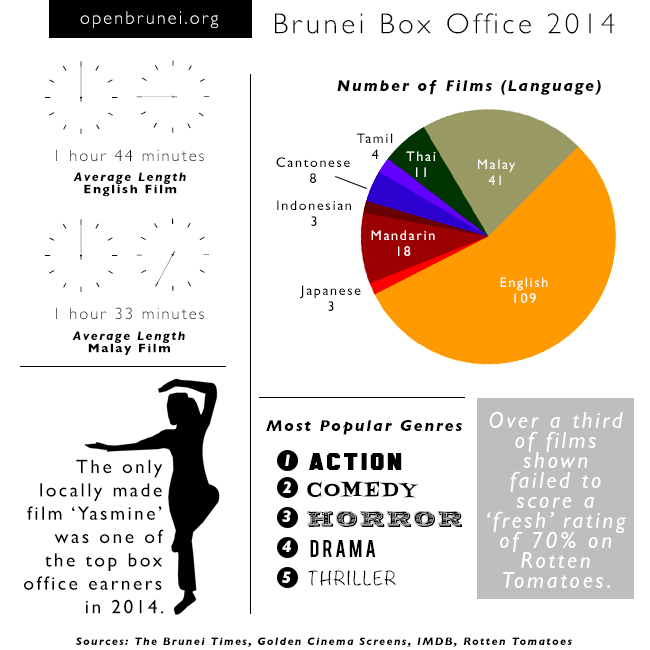 Faiq’s article Brunei Box Office 2014 involved manually collecting titles of films shown over a year. In particular, there is a gap that I’m interested in – gaps where we have general questions about Brunei, but the interested individual is unable to get answers – and I would like to see attempts to fill up this gap. I am particularly interested in the kind of questions that can be answered with data. Data itself is not that always what we need most; we need the information that comes from analysing or processing data. In general, having more Brunei information out there would be ideal. Comment from discussion In reference to ”Its not so easy to develop Brunei”. You can even learn to sing the national anthem in sign language (Flash Player required). Even then, this is an article about sharing and reusing data. While I will be sharing some thoughts about Brunei data, there are some open questions, and I certainly don’t have the answers to everything. A look at films distributed in a calendar year. Film titles were collated from Sunday editions of The Brunei Times. The data contains: language, genre (arranged alphabetically), runtime, IMDB score, Rotten Tomatoes score and film rating. Film rating for a majority of film are from the British Board of Film Classification, while others are from the Film Censorship Board of Malaysia.